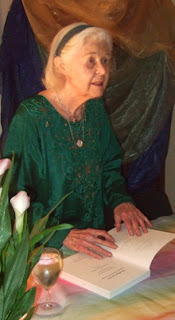 Late last night I heard the news that a wonderful Wiccan elder, Jean Williams, had died. This morning the news was spreading through pagan groups so I hope it is OK to write a short obituary here. Jean Williams and her husband Zach Cox were initiated as Wiccans in the 1960s. Jean became the High Priestess of Gerald Gardner’s coven in the mid-1970s. I met her on a few occasions and found her to be absolutely lovely as well as extremely knowledgeable about the Craft. Jean will be very much missed.